Variable Data Printing | Printing Technologies, Inc. In the age of traceability, everyone wants a code or mark. PTI gives you the versatility for variable data, whether it be a scratch-off game card or a large retro-reflective warehouse label. For short to medium label runs, our digital presses print 4-color process plus opaque white and black variable print. PTI’s 13” flexographic press provides 6 colors with high speed, high resolution black variable print (it can even print variable halftones). Our Markem press can print up to 4 thermal transfer ribbon colors with sequential numbering and barcoding. 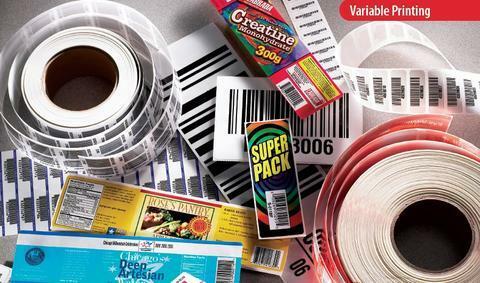 ​PTI’s Service Bureau prints static or variable data on a variety of thermal transfer facestocks for you, providing 100% barcode verification, and ensuring no missing or duplicate numbers. If you need help with design, PTI can create a label for you. We will ensure the label configuration will maximize print efficiencies, providing you with quality labels at a low cost.